The significance of the cellphone evidence that was presented at Adnan’s trial was extremely limited in scope. By the prosecution’s own admissions, the location data from Adnan’s cellphone billing records did not show the cellphone’s location at any particular point on the day of Hae’s murder. Instead, the nominal purpose of the location data was simply to demonstrate that the prosecution’s theory of the case was not disproven by the cellphone records. The prosecution’s expert witness did not prove that the phone actually was or probably was at any location – his testimony was introduced as evidence that it was at least feasible for the prosecution’s case to be accurate. The prosecution failed in accomplishing even that limited goal, however, for the reasons discussed below. The use of the cellphone data at Adnan’s trial was a jumbled, contradictory mess. The evidence was both used in a misleading fashion, and also factually inaccurate. Whether attributable to confusion or design, the prosecution misreported the expert’s findings in a way that caused the results of his testing to appear consistent with Jay’s story. [Waranowitz] also told you that the phone picks the cell tower based on signal strength in the area. He told you, too, that this map shows you — these bright colors each represent areas in which a given tower’s signal strength is strongest. And in these areas, the cell phone is going to talk to the given tower. (2/25/99 Tr. 61-62) (emphasis added). The prosecutor’s claim was simply false. Waranowitz never said any such thing. Instead, Waranowitz fairly presented the fact that coverage maps are estimates, based on factors that fluctuate and cannot be predicted with any degree of certainty – but in closing arguments, the prosecutor nevertheless presented the cellphone data as conclusive evidence of the phone’s location at the time of a call. KU: I will proffer to the Court that when we went to Mr. Waranowitz — when we were talking to him we said, we’ve got cell phone records and we have statements that this AT&T wireless phone were in these locations and these calls were received were made. Is it possible to test the system to see if it is possible for the system to respond in those places in these manners and that was the test to check out the cell phone records and the statements to see if it can be shown that this — that the system can respond in this way. He explained to use you can never say from a cell phone record the spot where something was, you can never prove that. You can only show through the fact that it initiated a call through a cell site, that it was in that coverage area for that cell site. But you can go to specific locations and see if it’s possible for the system to respond as the cell phone records do. That was his test. that was the purpose of it. THE COURT: Do you believe that the test that you presented to this jury was indicative of what you were trying to prove? THE COURT: Mr. Urick, why isn’t it irrelevant what a particular phone, an Erickson did on a particular day when the witness has shown through your questions that there are variables that would affect the performance of the phone which effectively makes your test totally irrelevant. If the weather was different, if there were leaves on the trees, if the model of the phone was different. I mean doesn’t in fact everything you’ve presented make the test null and void and irrelevant to this proceeding? You didn’t indicate that you did it with the same — ran the test on a day when the weather conditions were identical to the date that you allege that the body was buried. That the weather conditions were such that there was no ice on the trees, there were no leaves on the trees, that there was no snow on the ground, that the temperature was about the same, that the equipment that was used to test was the same. Your testimony that you’ve presented has not indicated any of the factors that your own witness say affects the performance and thereby doesn’t the test itself become misleading to a jury, to give the impression that the phone that was the subject of this case performed in the same way. I mean granted, the weight of the testimony must be made, a weighing must be made by the jury, but my question is aren’t we bordering on irrelevant versus relevant because the weight is so tenuous here that it might not even weigh anything at all? KU: The State respectfully disagrees, Your Honor. What we were showing is that yes, it is possible for this system to respond in the way that the cell phone records indicate it in fact did. We are showing the possibility that it did. This is corroborative of other testimony, hence it has great relevance, it goes into corroboration. THE COURT: So you’re saying no matter how weak or tenuous this might be that it is yet — it is only one item to be weighed in the context with other items that it occurred in the fashion that you’ve presented? KU: Yes, it is corroborative, therefore it is [ ]relevant. THE COURT: That is with [Jay’s] testimony that the phone did ring while they were at certain places to corroborate the fact that he was in fact in the areas that you’ve indicated. Ultimately, despite how “weak [and] tenuous” the cellphone evidence was, and despite her remarks that the limitations and unreliability of the data almost made it “null and void and irrelevant to this proceeding,” the trial judge ruled that the evidence was admissible, if of very dubious weight. The judge repeatedly expressed her concerns, however, about the potential of such weak evidence to mislead the jury. The problems with the prosecution’s use of the cellphone evidence was not limited to erroneous claims made in closing arguments, however. The evidence that the prosecution introduced was itself flawed and inaccurate, as discussed below. However, in order to understand the errors that the prosecution made, we’re going to have to get into the weeds with what exactly the expert witness’s evidence consisted of. AW: We decided where to put cell sites on what buildings, water tanks and towers. We tested them. we drove them. In other words, what I mean by drive, I mean testing them and we optimized them for performance. KU: [D]oes part of your continuing [employment] duties include working out any problems that may arise to the operation of that system? KU: And what do you do in regards to that? KU: Now, last fall we asked you to take a test of the system. Can you explain what the test was that we asked you to do? KU: Have you seen that before? AW: This is a — this a drawing, rather a map of the locations I drove and the cell sites that I measured. KU: And how is that map generated? From what data? AW: This was generated from an Erickson test phone while driving around in this neighborhood. KU: Was this generated the day we had you doing the test? The map in State’s Exhibit 44 depicts the area around Gilston Park. The road to the far right is I-695, the dashed road running north/south in the middle of the map is N. Rolling Road, and the road running east/west is Route 40. KU: The printed out three digit numbers [on Exhibit 44], do you know what those are? AW: Those are the frequencies we use. KU: Explain what you mean by that. AW: We have a range of frequencies much like radio and television channels that we use. We record those channels and how strong their signal strength is and relate it to the GPS location. That frequency, it can be identified specifically to a cell site. KU: And those numbers are printouts of what frequency is being used at any given — at that particular location? Based on the maps in Exhibits 44 and 45, which display cell site data that was recorded at short intervals as the testing vehicle was driven to various sites, the type of drive testing performed by Waranowitz involved a test phone that initiated short test calls at frequent intervals, and the tower sector that the call originated on was both displayed to Waranowitz and recorded by the computer. So to summarize: Waranowitz drove around west Baltimore using an Ericcson test phone that continually initiated outgoing calls and set intervals, and then recorded the strongest signal that the phone received when it made the call, which was identified as a three-digit frequency that corresponded with a specific tower/antenna. The result is a map which shows a series of numbers (each number marking each of the test calls that the phone initiated). For example, in the map above, “973” was the frequency used by L651A, “868” was L698B, and “882” was for L654C. Driving along Rolling Road, south of Route 40, the test phone initiated calls and regular and set intervals, and for each call on that stretch of the road, the test phone recorded 868 (L698B); similarly, north of Route 40 along Rolling Road, test calls recorded five signals from five different towers. As you can see, Waranowitz’s testing showed that someone making phone calls in that area could have had calls originating on up to 8 different towers, in a mishmash of overlapping coverage areas. In all, the prosecution had Waranowitz conduct a drive test of thirteen separate locations. One of the most remarkable aspects of the prosecution’s use of the cellphone evidence at Adnan’s trial, however, was that out of the thirteen locations that were tested, the prosecution had Waranowitz present maps displaying the results of his testing for only two locations. 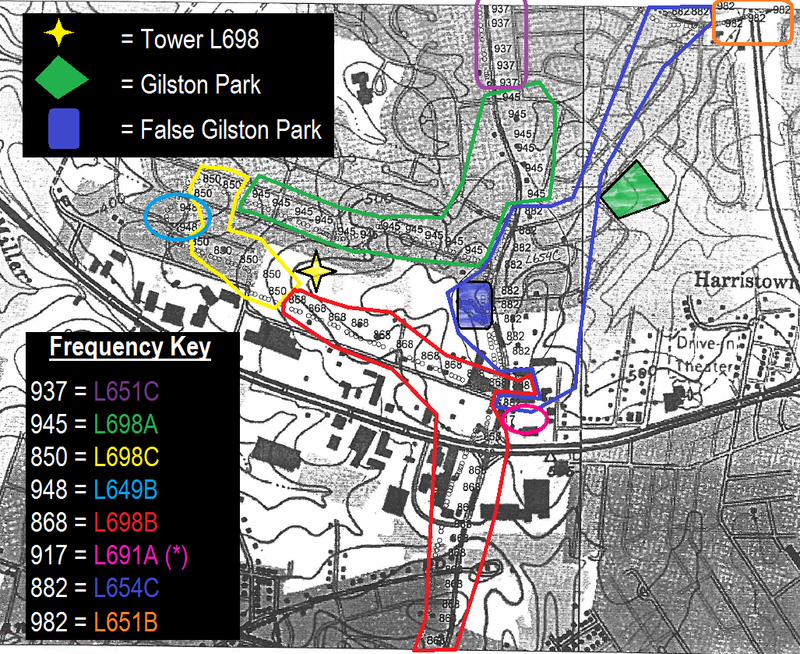 One map was made showing signal strengths around Gilston Park (Exhibit 44, above), and the other showed signal strengths around Cathy’s apartment (Exhibit 45, infra). GC: You didn’t report your findings to them? CG: After you completed all of the tests at the locations that don’t appear on the chart, after you completed them you had reported all of your findings to Ms. Murphy because she was there in the car with you, right? By having Waranowitz give verbal reports of his test results – despite the fact the data could be easily recorded and reproduced by his testing equipment – the prosecution thereby limited its discovery obligations to a fraction or what they otherwise would have been. So why did the prosecution not have Waranowitz also provide maps for the eleven other locations that were tested? Well, one has to assume it is because that data would not have helped the prosecution’s case. Why else would they have chosen to only introduce maps showing cellphone data for regions that have almost no importance to the case whatsoever? Why not a map of Woodlawn? Of Best Buy? Of Leakin Park? Why not show maps of any locations that had anything whatsoever to do with the actual murder and burial? What exactly was the prosecution scared of? Woodlawn High School triggers L651A. Despite the fact that the prosecution only provided the defense with cell data that had been so sanitized and rendered abstract as to be almost meaningless (and then incorrectly informed the defense that no written records of this testing existed), the information contained in the state’s disclosure of Waranowitz’s oral statements was inaccurate and misleading on several points. The location tested by the prosecution was not Gilston Park. Gilston Park is located to the east of Rolling Road. The prosecution instead tested a vacant lot. Even if the prosecution had actually tested Gilston Park, their testing would still have been irrelevant, because Jay never testified that he was at Gilston Park on the day of Hae’s murder. That claim was solely advanced by the prosecution. Gilston Park is, according to serialpodcast.org, actually what is known as Westview Recreation Area, at the corners of Gilston Park Road and Chesworth Road. But as serialpodcast.org also puts it, “This park stuff is a little strange.” There was no mention of either a Gelston or Gilston Park in Jay’s first interview, in which he claimed that after he dropped Adnan off at track, he went to his house. However, due to the detectives’ “correction” of Jay’s story (as a result of the incorrectly placed L654), Jay gave a different statement, and claimed that after dropping Adnan at track, he first went and smoked a blunt at “Gelston Park” before going to smoke more with Cathy and Jeff at Cathy’s apartment. Jay never mentioned Gelston Park again in any statement, and every statement he gave after the second interview sticks to the (fabricated) claim that he went to Cathy’s while Adnan is at track. However, once the prosecution realized its L654 error — apparently before the second trial — it changed its theory of the case, and developed a timeline in which Jay, after dropping Adnan at track, went to Gilston Park — not Gelston Park — to smoke a blunt. But this timeline was not based on the testimony of any witness. Despite the fact that Jay testified that he never went to Gilston (or Gelston) Park, the prosecution had Waranowitz perform testing at a location is claimed was Gilston Park, and then had Waranowitz “confirm” that the cell records were consistent with Jay’s testimony. KU: Did we ask you to go to G[i]lston Park? KU: And can you find that site on this large overlay map? KU: . . . Now, according to that overlay map that site is in — thank you, that location is within the cell site covering from 698, is that correct? KU: What if anything did you discover when you reached that particular location? AW: I discovered that the phones, 654C were stronger. KU: And is there a particular geographical location — feature there that caused that? AW: Yes, there is a small hill there that shadows L698. KU: And if I may approach the witness I’m going to show you what’s been marked for identification as State’s Exhibit 44. . . . . There’s some circles drawn on there, who drew those? As you can see, the area circled, in pen, is not even Gilston Park at all. It is an unused field, with no apparent name, and no apparent public use. KU: Now, if there was testimony that someone had dropped someone off at school to go to track practice and the person who had the car went to G[i]lston Park, parked for a while and then went back to pick the person up, if you found — and they called at G[i]lston Park, one or more incoming calls were received by the AT&T wireless subscriber telephone and then you found cell phone records that had calls from the L654C cell site, would that functioning of the AT&T network be consistent with the testimony? Jay: We turned and I believe at this time he wanted to get back to track practice because he said he needed to be seen. . . . We were traveling towards Woodlawn High School from Forest Park. KU: And what if anything happened next? Jay: I believe we stopped somewhere to buy a blunt . KU: What is a blunt? Jay: I’m sorry. It’s a cigar that you empty and use for smoking marijuana. KU: And what did you do at that point? Cathy’s house. Not Gilston Park. So how could Urick have asked Waranowitz, in good faith, to confirm that Waranowitz’s data was consistent with that did not exist? I think the most hilarious thing about the prosecution’s cellphone data has to be the fact that, out of 13 separate testing locations, the results from 11 of the tests were apparently so unfavorable and so damaging to the prosecution’s case that it decided it was better off presenting a map of testing that had been performed at the wrong location, at a place where no witness claimed that Adnan’s cellphone had ever been. But if the prosecution really thought the results from the testing of “Gilston Park” was either the best or second best that had been acquired from Waranowitz’s testing, the results of testing from the other eleven locations must have been really bad indeed. The prosecution wrongly reported the expert’s testing results in its disclosure of the expert’s oral statements. The prosecution’s disclosure provided that the expert witness had made statements indicating that a call from Cathy’s could originate on either L608C or L655A. However, for testing done at Cathy’s apartment, the findings that Waranowitz has reported were also recorded, and incorporated by the computer program that generated Exhibit 45. Exhibit 45 confirms that testing performed by Waranowitz showed that test calls made from close to Cathy’s house had originated on both L655B and L608C — but not on L655A. KU: Can you identify [State’s Exhibit 45]? KU: And what is that? AW: This is another drawing or computer generated graphic of the drove that I did on the day of the test. KU: And the geographical location that that map represents is what? AW: That would be the address that you gave me. KU: Now, when you got to the 470 block of Gateway Terrace what if anything did you discover about the functioning of the AT&T Wireless network at that location where you initiated calls? AW: I found that there were two cell sites very strong in that area. KU: And affect did that have on your phone? AW: Depending on where you were located on that road you could originate a call on one of two cell sites. KU: Now, if you look on 6, lines 14, 15 and 16. There you’ll see three calls. One through cell site 655A, the other two L608C. Were those the cell sites that you picked up in your test when you went to the 2700 block of Gateway Terrace? THE COURT: The numbers that appear on your State’s Exhibit 44 and 45, numbers like 860, 854, 911, 926, those numbers correspond to what? KU: We believe it’s a global position, satellite information system that allowed him to place his location when he took a reading and that’s what we believe he will say those are, but these are generated from the global position. KM: I’m sorry, Your Honor. THE COURT: The materials that were used by this witness to make this calculation are they materials or information or notes that were disclosed to the Defense? KU: If I recall correctly he actually printed this out at the time that he was — we were recording this. So, this was I believe simultaneously I printed up with the oral report that he gave us as to the location. These were the global position satellite was only briefly that day, these were the only two corresponding maps that he was able to print out, but they correspond and I believe were printed out at the same time that he gave us orally what his reading was at each location. THE COURT: So, the 44 and 45 represents the data that was used to make up your amended State’s disclosure? KU: Part of it, yes. THE COURT: When you say part of it, yes, what is the other part? KU: He had equipment to read the system to tell which cell site the signal was coming from. THE COURT: No, I understand that, okay. That’s — that’s his internal system? THE COURT: I understand — I understand, but the readings themselves are what appears in 44 and 45? THE COURT: Very well. Your objection is overruled. It’s noted for the record. You may proceed. (2/08/00 Tr. 80-82) (emphasis added). The conflict between Exhibit 45 and the prosecution’s Amended Disclosure of Waranowitz’s statements can only be explained by (1) the computer inaccurately recording the data reported by the test phone; (2) Waranowitz misspeaking when he was reading out the data in the car; or (3) the prosecutor incorrectly transcribing Waranowitz’s statements. I assume we can reasonably discount the first possibility — but whether Waranowitz read out the wrong number or the prosecution wrote it down wrong, this inaccuracy calls into question all of the test results reported in the prosecution’s amended disclosure. After all, the testing results were only recorded for two of the sites — and the report of those results was wrong for one of them. It simply cannot be assumed that the prosecution’s disclosure of the results for the other 11 sites was accurately reported, since out of the two test sites for which we can verify the prosecution’s disclosure with the data recorded by the computer, the tower data for one site was inaccurately reported, and the testing at the other site had been performed at the wrong location. In any event, we can conclude that, if the prosecution’s cellphone evidence has any accuracy at all, then a call received at Cathy’s house could not have originated on L655A, which means that the phone was not at Cathy’s when the 6:07 pm call was received – and Jay was, once again, lying about where the phone was at the time of a call. Then again, AT&T’s own records plainly provide that “[a]ny incoming calls will NOT be considered reliable information for location.” So who can say where the phone might have been when it received a call at that time? A call can originate on a tower that is several miles from the phone’s location, even when there are five other towers that are closer to the phone. The prosecution’s disclosure of the expert’s test results omitted the location(s) along Briarclift Road where testing was performed. This is significant because a call made from that location could have originated on L689B — and the prosecution’s case is almost entirely dependent upon its claim that calls originating on L689B indicated that Adnan’s cellphone was in Leakin Park. By failing to provide the address along Briarclift Road where testing was performed, the prosecution failed to disclose evidence which could have shown how far south beyond the borders of Leakin Park that testing showed a call could have originated on L689B. Of the 13 locations where the prosecution had asked Waranowitz to perform testing, one of the locations was identified only as “Briarcliff Road” [sic]. Presumably, the road the prosecution was referring to is Briarclift Road — a one-mile long road that stretches from Edmondson Avenue (Route 40) to the southern border of Leakin Park, east of Winans Way. However, the prosecution failed to disclose where along this road that the test was conducted. As a result of his testing, Waranowitz found that, on the day and time the testing was conducted, calls that the test phone initiated while the and prosecutor were driving along Briarclift originated on both L689B and L648C. In fact, there are five towers in all that are all closer to Briarclift– L651, L653, L654, L652, and L689. Yet Waranowitz’s testing showed that a call from Briarclift could have originated on either L689B or L649C, proving that a call can originate on a tower several miles away from the phone’s location, even when there are five towers that are geographically closer! In addition to demonstrating that Adnan’s cellphone need not have been close to a tower that a call originated on, Waranowitz’s testing on Briarclift road also conclusively established that a call made from outside of Leakin Park could originate on L689B, the Leakin Park tower. How far outside of Leakin Park does L689B’s range extend? Well, we can’t determine that, because the prosecution’s Amended Disclosure of the expert’s oral statements specified only that testing was done along “Briarcliff Road.” Waranowitz’s testing could have been performed at the border of Leakin Park, or it could have been performed .8 miles away on Edmondson Avenue. The prosecution chose not to inform the defense anything more precise about the test phone’s location. This omission, in itself, would seem to be significant. One can only imagine what the data would show if the prosecution had chosen to provide maps for the testing done south of Leakin Park, such as the maps that were provided for Cathy’s apartment and (fake) Gilston Park. 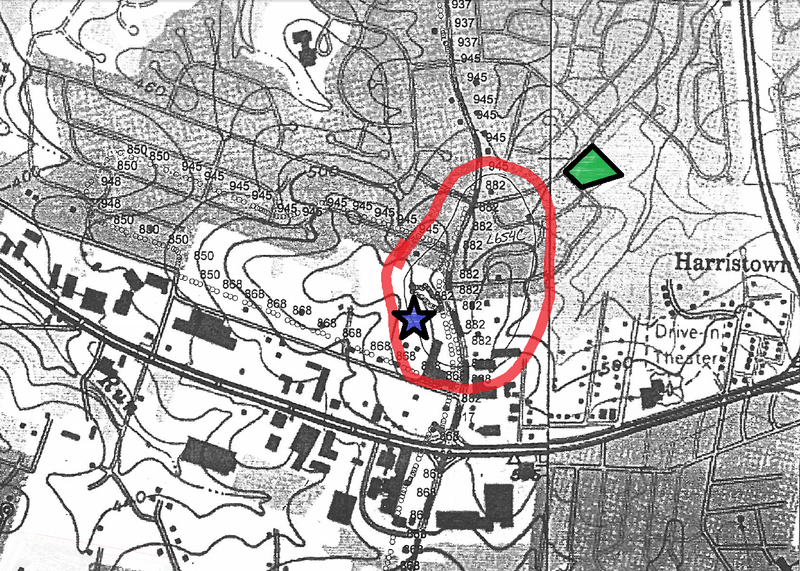 But I doubt it is a coincidence that the only two maps the prosecution chose to create for trial were maps of testing done at the two testing locations farthest from L689B. Is this because testing at other sites showed that a call could originate on L689B, even when the phone was far beyond the borders of Leakin Park? Based on the prosecution’s selective, inaccurate, and misleading disclosures of the testing data, I think that is a fair inference to make. The “Leakin Park burial site” was not tested, contrary to the representation made in the state’s disclosure. The expert made a test call while driving down N. Franklintown Road; he did not make a test call from the specific place where Hae was buried. The state’s evidence falsely suggests that a call could have been made from the burial site, when in fact the available evidence demonstrates that no reception would have been available at that location. Although the expert made test calls from various locations along N. Franklintown Road, no GPS data was provided concerning the locations where these test calls were made. The expert’s testimony proved only the following: if a phone was in Leakin Park, then assuming it could get a signal, it would probably originate on L689B. His testimony did not provide evidence to draw any stronger conclusions than that. Even if the cellphone could have made a call from the burial site — which, by all available evidence, it could not have — the expert’s testimony concerning the “Leakin Park” calls would still prove conclusively that one of the following must be true: either (1) the prosecution’s cellphone evidence was meaningless junk, or (2) the prosecutions start witness willfully and repeatedly lied under oath in implicating Adnan in Hae’s murder. One of these two things must be true. Although the prosecution’s case against Adnan would not have existed if it were not for the two calls that originated on L689B — a.k.a., the Leakin Park tower — the prosecution failed to introduce evidence at trial which could have showed that it was actually possible for a cellphone on the AT&T network to have made or received a call from the site where Hae was buried in Leakin Park. 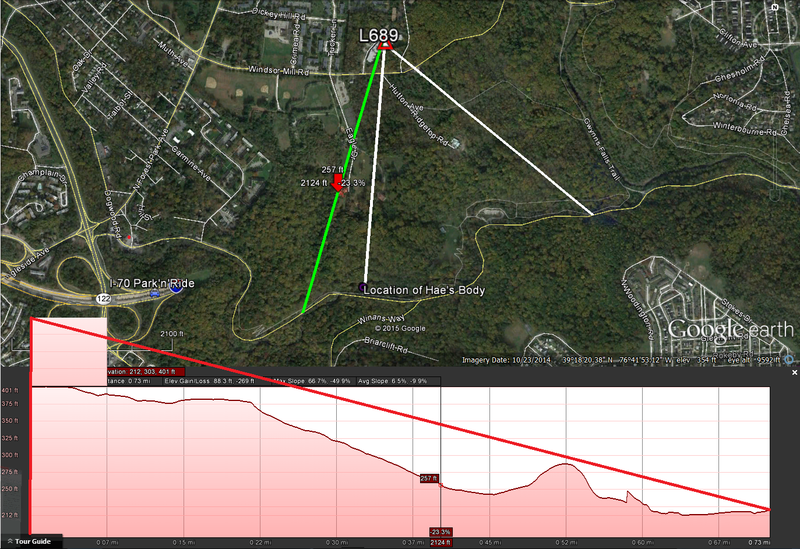 Moreover, the evidence that is available demonstrates that AT&T’s wireless network would not have provided coverage at that location, because steep terrain between tower L689 and the burial site would have obstructed the radio signals necessary for a call to have been made or received from there. Because the prosecution failed to acquire evidence necessary to demonstrate that Hae’s burial site would have had reception (i.e., such as by actually making a call from the burial site), there is no evidence that some unexplained topographical feature could, somehow, have provided reception in that area despite the lack of any line-of-site to a tower in the AT&T network. The cellphone expert’s testimony did not demonstrate that such a phone call would have been feasible, because the expert was not asked to conduct a test from Hae’s burial site itself. The testing was done while in a vehicle along N. Franklintown Road, and there is no evidence that any of the test phone’s periodic test calls had been made when the phone was actually adjacent to the burial site — because the prosecution declined to provide GPS data for testing done in that location, despite the fact it could have easily been made available, as shown by Exhibits 44 and 45. 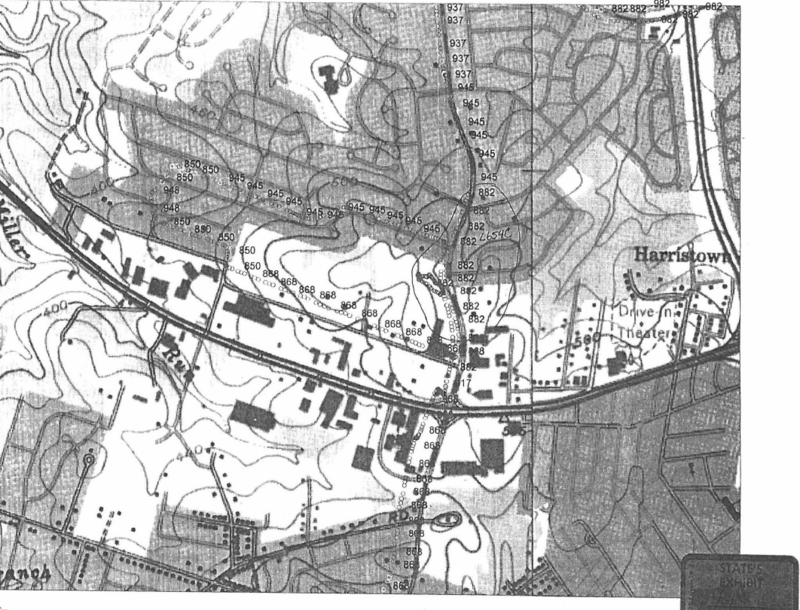 Moreover, as cellphone reception would likely have existed only a few hundred yards to both the east and the west along N. Franklintown Road from where Hae’s body was found, the expert’s data concerning Leakin Park is most likely reporting the signal that was registered by a test call that was initiated either just before or just after the burial site. CG: Now, sir, when you went to that place and again, to make sure, you were on the road side of the Jersey wall barriers, correct? In order to be on the “road side of the Jersey wall barrier,” Waranowitz’s testing must have been conducted on the road itself — and based on Waranowitz’s testimony concerning how testing was done at every other location, the car he was conducting the test from was driving down N. Franklintown Road. KU: And what system did it use to generate this data from? What’s the global tracking satellite? AW: GPS . . . Global positioning system. KU: How do you use it? Strikingly, however, the prosecution declined to acquire (or, if they did acquire it, to provide) GPS data concerning any testing of the network that took place in Leakin Park. Now, again, why would the prosecution have gone to the trouble of providing the jury with the results of cellphone testing with GPS coordinates for two locations with little relevance, if any, to Hae’s murder, but then declined to provide GPS coordinates for the testing done at the burial site, where the two most important calls to the prosecution’s case were allegedly received? Jay never even testified that Adnan’s cellphone had ever traveled to Gilston Park — let alone made or received any phone calls there. So why did the prosecution have Waranowitz generate a report showing which tower had the strongest signal strength for dozens upon dozens of precise GPS-identified locations in the Gilston Park area? Well, it is either because the prosecution was oblivious to the significance of the cellphone location data, and erroneously believed that a GPS-backed report of the towers a call in Gilston Park was likely to originate on was more crucial to its case against Adnan than was a similar report for the Leakin Park Area; or else it is because the prosecution believed that a GPS-backed report of the signal strength in Leakin Park would not have supported its case. Either way, it does not make much difference. The prosecution’s case does not include any data that can be verified through replication, because it failed to give the locations of where testing was performed. Moreover, the prosecution’s disclosure of its testing results contained a serious misrepresentation of fact, and erroneously stated that, contrary to the expert’s testimony, that his testing had been done at the “Leakin Park burial site.” If the defense had assumed that the prosecution had been truthful in its disclosures — and why shouldn’t they have? — they would have been left unaware of the fact that no one had actually tested whether it was possible for a phone at the burial site to make or receive any calls. Which is a big deal. Because it probably could not have. 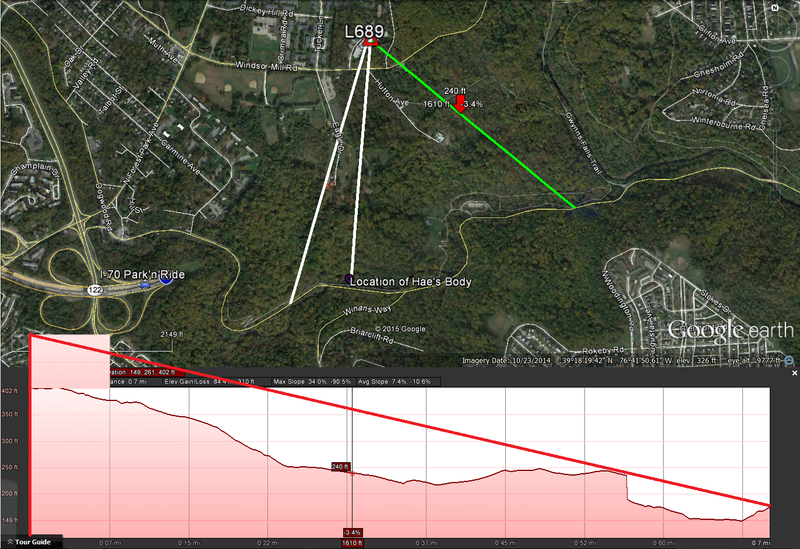 Elevation profile for burial site. Terrain blocks line of site to tower. Elevation profile for N. Franklintown Road, east of burial site. Elevation profile for N. Franklintown Road, west of burial site. None of this would have been a surprise to the prosecution. They were well aware of the problems with cellphone reception in the Leakin Park area — particularly the areas near Dead Run. Like, say, the burial site. KU: Mr. Waranowitz, what if any difficulties are there in [Leakin] Park in terms of reception for the cell phone network? THE COURT: Sustained. As any cell phone network or as it relates to AT&T cell phone network? KU: What if any reception problems as the AT&T wireless network experience in the [Leakin] Park region? THE COURT: You may answer the question. CG: That road, however familiar you are with it, runs the breadth of L[eakin] Park throughout Baltimore City, does it not? AW: I think so, yes. CG: And, sir, are you aware of the difficulty any cell phone user has regardless of phone, regardless of network of actually speaking on the phone while one is in Lincoln Park? CG: You are aware, are you not, of the difficulty any cell phone user no matter what cell phone is used in actually . . . receiving a call while one is in L[eakin] Park? CG: And that’s not a surprise to you, is it? AW: No, it is not. CG: Because the terrain in L[eakin Park] Park is difficult, is it not? CG: And there’s a major stream or waterway that runs through L[eakin] Park, is there not? CG: And you’re aware that the banks of the waterway because the terrain is uneven is often times below what we call street level, referring to the level of [N. Franklintown Road]. AW: Yes. . . .
CG: And notwithstanding that, your network has been launched now for maybe up to three years, L[eakin] Park as a coverage area, it’s always been difficult, has it not? In short, the prosecution was or should have been on alert that it would likely have been impossible for a call to have been placed from the burial site, and yet — or rather, and as a result — they chose not to perform any tests at the burial site itself. KU: When you pulled off and parked the vehicle, what if anything did you take back into the woods with you ? KU: About what time of night was this? KU: What was the light like? Oh, Jay. Let’s hold up a second — before we get back to cellphone data, I need to recount just a few of the glaring problems with this testimony: (1) Adnan told Jenn that “he was busy now”? All of Jay’s previous statements had Adnan saying that “Jay is busy now.”; (2) The moon was out? No, no it was not — moonrise was at 4:37 a.m. that night, and was a bare sliver, with around 10% illumination; (3) according to Jay’s story, he has not even paged Jenn at the time he and Adnan were digging the hole — that happens after digging the holes, while Adnan is getting Hae’s body out of the car; and (4) why would Jay and Adnan bring the shovels back to Adnan’s car after digging the hole? They still had to cover up the body! It’s a completely inefficient body burial process. KU: Now, if you will look on the exhibit, lines ten and eleven, there are two incoming calls. While you were back there either digging the hole or burying the body, do you remember him receiving another phone call? Jay: Yes, but I don’t know who it was . KU: Did he speak in English? KU: And the other parts, did you know? Which means according to Jay’s testimony, he and Adnan were at the actual burial site, digging a hole, when the 7:09 and 7:16 incoming calls were received. No wonder the prosecution was too scared to try and make a test call from the actual burial site. The Leakin Park calls were the prosecution’s entire case – better not let the jury know that Jay was lying about those too. Amazing work as usual. Still processing this, but just amazing. If you really want to convince people, release the cell experts testimony unedited and in full. Parsing that and cherry-picking information to make your case is disingenuous, as is most of your conjecture. Just noticed the transcripts. Kudos… about time. If you had any sense, you’d apologize. If s/he wasn’t a jerk, s/he’d apologize. Astonishing behavior! Just plain rude. SS was “cherry-picking”? No. I think that’s what the prosecution did. Yeah trolls can’t help it but it amazes me the sense of entitlement that some people have. This is information that someone else spent a lot of time and/or money to collect and yet somehow they imagine they are entitled to it without so much as a please or thank you and certainly with no effort from them. I’ve tried to stay neutral and restrict my opinion to the legalities. But without any real case, and with all the lies and the implication of deception on the part of the investigators and the prosecution, at this point I’m wondering and have serious doubts as to Adnan’s guilt. Clearly nobody expected much scrutiny of this case. If Adnan is not guilty, and if this was a standard way to conduct and investigation and to prosecute people, one can hardly retain much confidence in a system that does this to people. I feel an odd sense of emptiness. We knew that Jay lied, elaborately, repeatedly, and badly. We knew that Urick wasn’t the sharpest knife in the drawer, and that the detectives locked in on Adnan and worked their case almost exclusively from that perspective. And we knew that CG, despite her tenacity in cross examination, couldn’t be bothered to pull the case together to adequately defend Adnan. But I expected at least a little something regarding the cell tower data. Just a shred of credibility, somewhere, to maintain the charade of good faith by the prosecution. Now I just feel sad. Hae’s death was a tragedy, and so was this prosecution. Yeah. Idk if it was CG’s declining health or just her style, but she was way less clear establishing a narrative. I read the transcripts (sad that I would d that on a Saturday night ….) and she asks a lot of interesting questions… but never gets down to the point. After she questions the cell expert, Urick redirects and asks like 10 rapid fire simple questins that indicate that calls happened from leaking park from adnan’s phone. And then instead of CG coming back and saying it could have occurred up to x miles away, or that you very well may have not had cell phone coverage at the burial spot, she asks more confusing questions about how many apartment buildings are within the towers range etc. I guess the point is she didn’t tie together reasonable doubt (of which I think there is some). Instead she asked confusing questions INSTEAD of making a coherent counter narrative. If she can’t tie the pieces together, what is the jury to think? They were likely very confused, Urick offered a cleartheory and CG did not. Which was really damning. Same thing with Jay’s testimony (at least from trial 1). She simply doesn’t tie the pieces together…which doomed adnan. Why would Jay lie about the existence of moonlight??? It seems like his strategy was to switch in Adnan for himself. In other areas he seems to have weirdly accurate information about exactly how the crime occurred (as reported by Adnan supposedly). Did the real burial happen days later in the moon’s cycle? That doesn’t fit with all those calls to Jen on the night in question. Could Jay have dug the hole late in the afternoon while it was still light? If he was digging the hole first and then needed to get Hae’s car later for the burial, that might explain taking the shovel(s). He would have been leaving for a longer time and coming back in a different car. He could have been, That leaves most of his testimony inexplicable though. If Susan has children, there’s no chance of them getting away with lying to her! Didn’t expert testify to actually making a test call from near the burial site, and not using the drive testing data for such a test? CG asked him this repeatedly, in several different ways. He said no, he did not. He only tested Leakin Park from N. Franklintown Road. He was clear he never went past the ‘Jersey barriers.’ He also made clear that there were places along the road where signal strength was inadequate for call connection. There are a lot of comments there. Which ones? You’re going to need to be more specific. The first post (earliest?) doesn’t contain a question. Why don’t you just ask the question you think needs to be answered? “Regardless of how much closer L651, L653, L654 or L652 are, without Line of Sight, they won’t be able to connect. 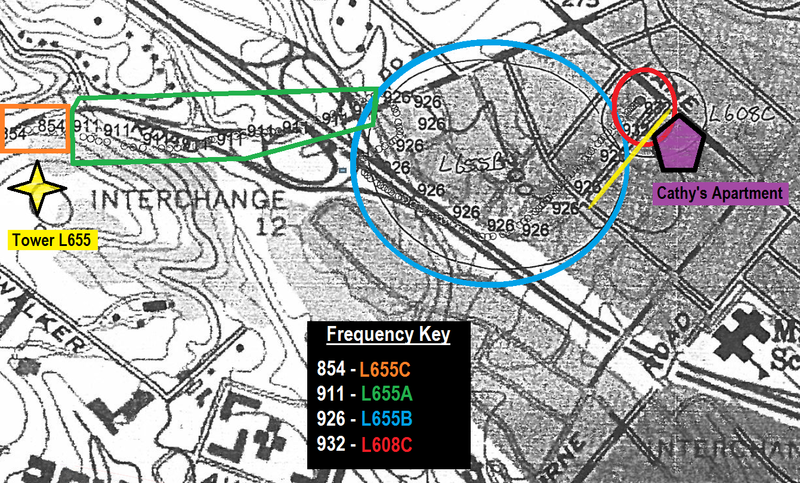 So what all of this really tells us is L689B very likely, almost certainly, only covers the park. Therefore, the 7:09pm and 7:16pm calls are almost certainly coming from the Park. 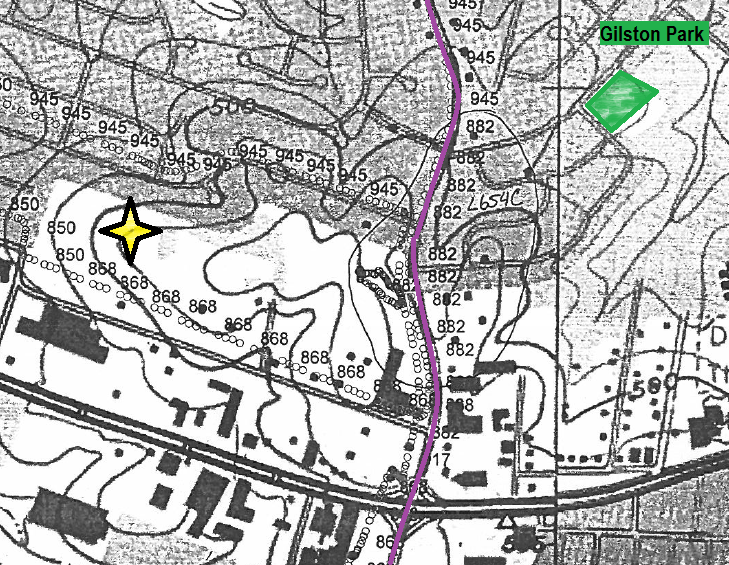 Line of sight existed for L654, L653, and likely L652, although that’s a closer question. There are no technical counterpoints to address there. 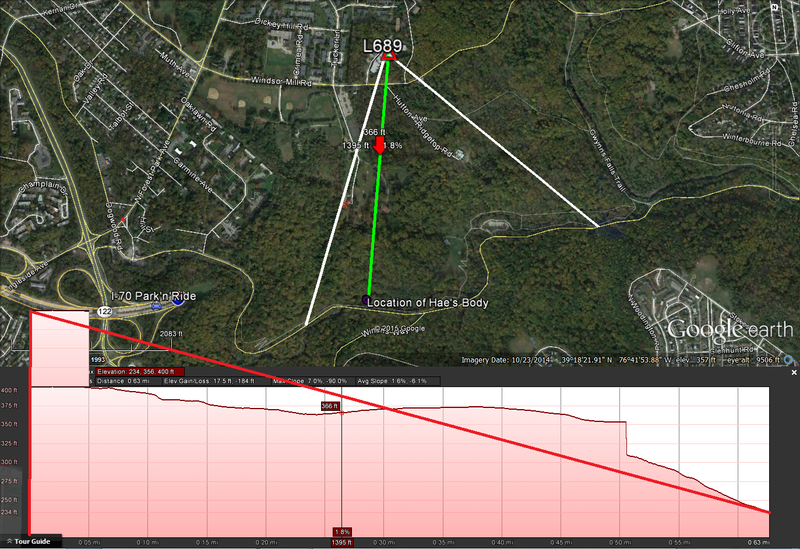 Additionally, and probably the most important evidence from the expert witness testimony is that L648 has a stronger signal than L689 for a location about three times closer to L689. This means that L689 is a low power antenna. It loses coverage in the park and definitely outside the park. What am I supposed to say to that? It is incoherent nonsense. Well, imagine you are a cell phone, and you have been asked to place an outbound call at whatever location this was. You detect signals on multiple frequencies over which you could place the call and several candidate frequencies are found, including signals from L648 and L689. Next you find the signal that is strongest, and L648 has the strongest signal, so you choose that tower. The phone has no way of knowing how far away any of these towers are, it can only find signals on certain frequencies and assess the strength of the signal on those frequencies. I would take that data back to the RF engineer you spoke with and ask them whether different towers have different transmission powers and if the fact that a phone selects a tower that is much farther away from a nearby tower could be because the nearby tower has a much lower power transmitter. Or, you could likely look up the transmitting power of both towers and verify this possibility directly. It could also mean that there are multiple locations where towers other than L689 have better line of sight to the phone. But at any rate, none of this data seems to be suggestive of significant coverage by L689 outside of the park. Rather, there just seems to be no measurements, or not enough measurements, to draw any conclusions about how far outside the park the LP tower could likely have been selected for placing calls given competing signals from other towers. It does seem to support claims that, if your call is received or placed by L689 then you are likely in or on your way into or out of the park. I don’t see anything in the disclosure or testimony indicating that you could be as far south as Edmonson Ave., for example, and ping L689. If I’ve never seen a cat, and someone shows me two manxes, I might assume that cats don’t have tails. If I later found out that person had 100 cats, but picked out only the two manxes for me to see and kept the rest hidden away, I might infer that they were trying to mislead me into thinking that cats don’t have tails. I’m only saying nobody is justified in making any claims about whether calls placed outside the park could have been picked up by the LP tower, much less which areas those would be. I agree with you that there is no data supporting the claim that calls made outside the park COULD NOT be placed by the LP tower. I do have a hard time believing that a tower that has spotty coverage within the park and loses out to towers much farther away in some locations makes it very likely that the same tower is going to have better quality signal compared to other towers as you head to the south away from the park. In the absence of measurements in these areas, though, I don’t think any claims that the phone could have been in locations other than inside the park can be substantiated. So, you have supporting evidence for claims that the phone was in the park, but you don’t have supporting evidence for claims that the phone could have been outside the park. In my view the best that can be said is that the existing evidence is inconclusive about where the phone was with any more precision than “somewhere south of the B sector antenna of L689”. The signal strength isn’t weak at the burial site because of the tower having a worse quality signal. It’s due to a big old hunk of earth being in the way. It would have *better* coverage outside of Leakin Park. 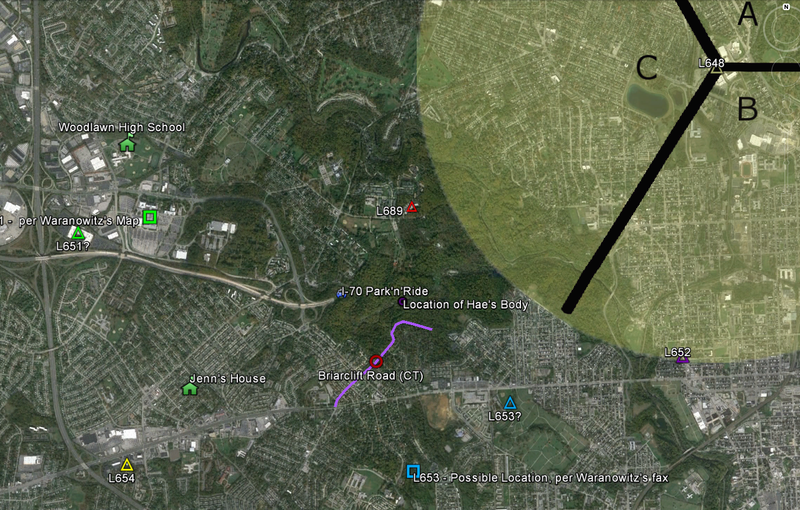 L689B did extend beyond Leakin Park, see the test results re: Briarclift. Rupert, you keep referring to theoretical outgoing calls. The calls in question (7:09 and 7:16pm) were incoming. We all know the ATT cover letter was very specific that incoming calls could not be used for location. I know the RF experts on reddit debate how much of an issue it is, but we should at least be accurate about what was really happening, and that for whatever reason ATT did not want the police to use those calls the way they did. The question could have been resolved if the prosecution had taken a phone to the burial site and made several calls to it, and then moved the phone to the site on N. Franklintown Rd. where Jay says they parked and send a few more incoming calls. But they didn’t. I’m not sure what data you’re referring to regarding Briarclift. That road is on the park border in parts and we don’t have any geo data confirming where those calls were being placed, so I still don’t see anything conclusive. Did I misinterpret something about the available data for Briarclift. Kevin, I am not talking specifically about the inbound calls at those times from Adnan’s call log. I’m talking more generally about the GPS + tower ping data that was collected by the State. I’m saying that the available data from the State does not provide us with conclusive evidence about the coverage of the LP tower to any significant region to the south of the park’s borders. Like, I’d like to see several points along Edmondson ave pinging the LP tower. I believe it’s possible that, if measurements were made there we would see that this is possible. It is a shame that we don’t have anything this conclusive, one way or the other. @ Rupert, thanks, I misunderstood your question/comment. I agree that we know far too little about the coverage of the LP antenna. That Adnans_cell guy doesn’t know where the L689B antenna was pointed, so he can’t say what it *wouldn’t* cover. What nonsense. With all the questioning if Adnan is guilty beyond a reasonable doubt, or flat out innocent, I wonder if anyone else is questioning what the real deal,with Jay is. Because I can see, absolutely, how terrible it was of him to have known what happened to Hae and he never said anything until he was forced to (or not smart enough to lawyer up immediately, then again, it turned out ok for him in the short run). What a terrible thing to be a part of, and say nothing, while her family suffered and wondered. But I also see how Jay may have also been a victim. The previous post about how the prosecution nudged him into changing his story to match (incorrect) cell tower locations shows how he was used by the prosecution to win their case. He was coached and hinted at and threatened if he didn’t cooperate. He was a kid too. I think most likely he is covering up for somebody else, though I don’t rule out he did it alone. But I think he knows he sent an innocent person to jail. I would think the prosecution and police fed Jay the whole story, but I’m having a hard time believing he really had nothing to do with it and the police lied about him leading them to the car. Though apparently, anything is possible. Jay knew where Hae was buried. Yet, for weeks he lets the family suffer with fear, hope, and whatever else one goes through in situations like this. A simple anonymous phone call would have done. Those are not the actions of a victim. That is extreme selfishness and criminal. There is not one shred of evidence that Adnan is guilty. No physical evidence, no witness, no cell phone records. Nothing. All we have are Jay’s lies. Susan inexplicably fails to point out that the Day 2 transcripts are missing pages: 89-92, 117-120, 141-148. Ah, yes. The cross-examination. Everyone knows that’s where the crucial evidence proving the prosecution’s case is kept. I’m sure you take the same attitude when opposing counsel provides you with incomplete documents. “Trust us, Susan, there’s nothing interesting on those pages … ” Yeah right. I’m going to assume the omissions, whether intentional or not, originated on Rabia’s end. The explanation could be innocent, but seeing as how you’ve won (some degree) of prominence as an advocate for Adnan Syed, you ought to be a bit more inquisitive and circumspect lest this whole thing blowup in your face and damage your professional reputation. Which is not something I’m gleefully anticipating, it’s just that when someone who is otherwise so thorough makes light of the fact that entire pages of testimony are missing, it points to a pretty glaring double-standard / blind spot. Rabia is not responsible for the missing pages of the transcripts. The missing pages are missing from copies of the transcripts that pre-date Serial by many years. In the files, there are sometimes multiple copies of a transcript, such as when it has been included as an attachment to a brief or letter. These documents are written by people other than Rabia, using documents that did not come from Rabia, and they are missing the exact same pages. I really love your posts and it’s obvious your analysis is clear, cogent, and objective. This post in particular is exceptionally researched and presented. I’m sure you can see how the concern over the missing transcript pages is a reasonable one. Certainly its conceivable that many would question the credibility of your analysis if the transcripts you upload are incomplete. Could you please provide for us either the missing pages, or a (non-NVC like) explanation for where they are? Thank you, and keep posting!! Just saw your explanation above. Thank you! I agree with Second Generation — the sarcastic tone is a little jarring (I say this as someone completely in sympathy with the argument of the post, and with your broader analysis of the case). I wonder if the problem is that I (and we) aren’t familiar enough with the process of legal record-keeping. Is it common for portions of trial transcripts to be missing like this? What are the most likely reasons for the gaps? Additionally, it appears that I aren’t familiar enough with the conventions of subject-verb agreement. If PB was asking in good faith, then I do apologize, that was uncalled for. But I assume not — since it’s essentially an identical comment to several others I’ve had to delete because they’ve been spammed repeatedly in what appears to be an effort to clog up discussion. I’ve answered this question dozens of times, but it still gets asked three or four times a day. There is no conspiracy. After 15 years with paper records, things get lost. These files have been torn apart and scanned, attached to briefs, shuffled around, and sometimes mixed together. But I do find the idea that withholding scattered pages from a cross-examination transcript is somehow an attempt to misleadingly portray the state’s case to be pretty funny. Ah, of course. I must have missed the other points in the conversation here and on Reddit where you addressed this issue. Completely unrelated: in your second description of exhibit 44, you explain that “the area circled, in pen, is not even Gilston Park at all. It is an unused field.” It was not super-clear to me which area that was: is it the loose circle around the 882 ft portion? Perhaps use a little of that MS paint magic to clear things up? Just for you. Waranowitz’s circle is circled in red, blue star is fake Gilston Park (actually, just above top right prongs of star, it looks like someone tried to draw it in). Well I chuckled….it’s easy to see that your arguments are logical and clearly presented with supporting evidence from the transcripts. A little sharp wit never hurt anyone….right? Finally! The transcripts can’t wait to see what he said about Leakin Park, particularly on cross. It’s important information to know IF Adnan gets a new trial. Agree. Though if his conviction gets reversed and a new trial is ordered, I highly doubt the prosecution will have any choice but to drop the charges. i think this is mainly helpful for excluding all of the records from evidence if he gets a new trial. Does anybody know if a call made from the west of a cell tower could connect to the B-side of that tower(since the B side faces south-southeast). My impression was that it was not possible. So I don’t understand how a call could go to L689B, if the cell phone was at or near Adnan’s house(which is quite a ways west of L689 tower). The A, B and C towers don’t always point in the same directions. The engineers could physically point the antennas in whatever direction they wanted to optimize the network. Well done. In fact, if there was no cell phone signal at the actual burial site, (down in the wooded area by the stream, next to the 40-foot-long fallen tree), the incoming calls at 7:09 & 7:16 would not have able to be routed to Adnan’s phone, and would have been forwarded to voicemail instead. The call log would have shown that the unanswered calls were sent to voicemail (like the the 5:14 incoming call forwarded to voicemail). But the call log indicates these calls were answered. Which makes Jay’s testimony even less credible. Your link to the FCC ASR database doesn’t work. Can you please identify the L689 antenna by its ASR number? Your link points to 117784, but that’s not a valid ASR number. There is a lot of misinformation and distortion there. Does he actually think the tower can provide coverage through a couple thousand tons of rock and earth? I have to assume not, so I’m not sure what his point is. Right. He’s not distinguishing between a tree (or a roof) and hill or other mass of earth and rock as the item that is disrupting the line of sight. His post, which was much more insulting and substantive, has now been removed, whether by himself or the moderators. The mods of the subreddit have announced a crackdown on the lack of civility. We shall see. I don’t understand how the conflict of evidence presented by the prosecution team being note taking assistants for the AT&T engineer could have been allowed to be presented to court unchallenged. Surely CG must have wanted to question the partiality and potential for errors of the prosecutors making the written records of the AT&T’s engineer’s findings. Why didn’t CG call KU and the other prosecutor to the stand to ask them pertinent questions like – Are you qualified in this field of work? Are you sure you accurately recorded the info? Did you interfere in the way in which the expert witness carried out his work? Etc etc. Yes, the potential for intentional or inadvertent biasing of the data is huge. My big question is, how was it decided when and where to do the GPS mapping? That’s the data that would actually help clarify any of the questions that are continue to debate. Did the prosecutor have the engineer do a few test calls, and if the results potentially invalidated much of Jay’s and the state’s scenario, then just jotted down a couple of towers. They clearly made choices about where they were doing the mapping, and it sounds like the system was set up to do that pretty much automatically. It really fits with the lack of investigation of the people (Phil, Patrick, ?Pete) that Jay called, and the lack of effort to confirm who made the various incoming calls. They found their “come and get me” call, and their “we’re burying the body” calls, and avoided finding any information that would mess that up. – where the science is “new”, the lawyers often don’t understand it well enough to effectively cross-examine on it, and they too can overstate its importance. These problems have been identified in the last 10 years or so, and judges are becoming more stringent about qualifying experts and making sure they don’t overstate their case. I was actually impressed by how critical the judge was for that time. But no way should this evidence have gone in the way it did. Yes, the judge was clearly troubled that the prosecution made no attempt was to duplicate the conditions that existed on January 13, 1999 when they did their drive test nine months later. Who knows how many times these cellular base stations and antennas were retuned, adjusted, tilted or otherwise modified to correct or improve network performance and capacity in the interim. This was the old D-AMPS (TDMA) network, and due to capacity constraints, limited spectrum, and frequency reuse, it was commonplace for cell sites to have channels added or changed, or antennas adjusted or tilted, which would cause interference from neighboring towers, which would in turn have to be retuned. See http://www.privateline.com/mt_cellbasics/index.html And even though AT&T would have routinely done drive tests of various parts of its Baltimore network and had reams of drive test data in its possession showing signal strength, GPS coordinates, frequency channels, and other cell site data for the relevant locations for the relevant time period, nobody tried to subpoena those records. Amazingly, Urick clearly admits to the court that the expert explained to him that historical single-tower cell phone call detail records cannot be used to prove the location of the phone at the time the call was made: “He explained to us you can never say from a cell phone record the spot where something was, you can never prove that.” 2/8/00 trial transcript 17:17-19. That’s a stunning admission. The call records only show that the phone was somewhere within the range of that cell site at the time the call began, but that could be a very large area (if a cell tower has a 3-mile range, it’s coverage area is 28.27 square miles; the azimuth narrows it down to 10 square miles, but that isn’t particularly helpful in placing a defendant at a crime scene). Although Urick is very forthcoming about the limitations of the call records outside of the jury’s presence, it is very common, once testimony is admitted, for lawyers to mischaracterize or misstate the testimony in summation. Urick definitely misstated the cell location evidence in the Intercept interview. @Susan, can you shed any light on the following: 1) Did Urick say anything in his closing argument that mischaracterized the expert’s testimony or contradicted his concession to the court (quoted above) that cell phone call records can never prove the location of the phone? 2)The judge denied the defense motion to strike all of Waranowitz’s testimony, but she is clearly very wary and wants to prevent the jury from drawing unwarranted conclusions from what she calls “borderline irrelevant” evidence, and asks counsel to craft a special jury instruction that will strictly limit how they weigh this evidence, so what was the actual jury instruction regarding Waranowitz and the cell location testimony? The closing was by Kathleen Murphy, not Urick, but I’ve got a whole post coming on all the errors in it. They go way beyond the snippet I quoted at the start of the post, where she falsely claimed that the coverage maps actually showed the area where a call was made when a call was made or received. Now, there was expert witness testimony given in this case. An expert is a witness who has special training or expertise in a given field. You should give expert testimony the weight and value you believe it should have. You are not required to accept any expert opinion. You should consider an expert’s opinion together with all other evidence in the case. Brilliant as usual, just a first read, but this seems extremely tight and concise. Excellent work. Thank you. This is very interesting stuff. I *am* a little troubled by the assertion that it would be impossible to ping that tower from the burial site. Radio waves are weird and highly unpredictable. I didn’t buy the prosecution’s arguments, but I’d want input from more than one RF guy to believe it was just completely impossible. I wonder if it’s still possible to test? Towers are different now. Not possible. I’m confused. I thought this type of analysis had NO relevance to incoming calls. What am I missing? If, for the sake of argument, you accept Position # 2, (“if the prosecution’s cellphone evidence has any accuracy at all…”) then Jay is lying. If you accept Position #1, then you’re right, it has no relevance…. all you have to go on is Jay’s ever changing stories. The calls received at Cathy’s puzzle me after reading this… The tests state that outgoing calls close to Cathy’s do not ping tower L655A. This means, as I think you have stated, that the 6:07pm call cannot have taken place at Cathy’s house. Presuming that that it is correct, Cathy says that they come in her house and…. a) Jay sits down and she attempts to have a conversation with him which doesn’t make much sense so she eventually gives up. Meanwhile Adnan slumps on the cushions and doesn’t speak for a period of time. b) Adnan then gets a call where is seems nervous that the police might ring him as he’s stoned. This however doesn’t seem to fit in with the call logs. Cathy doesn’t give the impression that the 6:09pm call happened as soon as Jay and Adnan walked through the door of her house, which it would have to have done given the above timings. It seems more likely they sat down for at least a few minutes before Adnan received the call, rather than 60 seconds or less. Is it possible therefore that the fact that it was an incoming call mean that the tower could have pinged L655A when Adnan and Jay had been at Cathy’s before 6:09pm? In response to a comment, you wrote, “Waranowitz’s circle is circled in red, blue star is fake Gilston Park (actually, just above top right prongs of star, it looks like someone tried to draw it in).” However, when I view https://viewfromll2.files.wordpress.com/2015/01/ew-ex-44-closeup.png?w=2980, I do not see any blue or red only yellow, green and purple. I am not sure what’s up but I expect others may have a similar problem. As always thanks for your great work. Thanks for your wonderfully clear analysis of the shortcomings of the prosecutor. Will your analysis directly help Adnan’s appeal request? I hope so. I can’t be the only one who was/is extremely excited that Susan and Rabia have joined forces. The YT clips were pure joy. More seriously speaking, looking at the big picture I’m amazed at His work in bringing intelligent people together to work on Adnan’s case. I pray God continues to bless and protect these people who fight/provide hope for an innocent man. From the bottom of my heart I thank you Susan for every ounce of work you have put in. Would’ve been nice if He would have given Adnan a decent lawyer instead of waiting around to micromanage things 15 years later! We haven’t ‘joined forces,’ to clarify! We’ve become friendly as a result of discussing Serial, and I respect what she’s doing, but our goals are completely different. Rabia has let me review the files because she likes the analysis I’ve done, but I will continue to write about what I find interesting, regardless of the direction it takes me. More fodder for ineffective assistance of counsel: not having her own expert to demonstrate these problems. I couldn’t imagine going to trial without my own tech expert if the other side had one. It was an absurd thing to do. Same for her failure to have even a basic understanding of the (admittedly sparse) documents that were handed over to her. I hope that when you’re done parsing the evidence, you’ll help us non-legal people by writing a post which summarizes your work. It would be interesting to read a final analysis or argument of where you stand now. Have you tried to contact Waranowitz himself? Honestly, I’d be really surprised if anyone can get a cell signal from the burial site to this day, unless it’s from a different cell tower. A low-lying area near a stream with trees all around it isn’t likely to have coverage. The ice storm that happened that night probably knocked out a bunch of cell towers. I would like to see Waranowitz’s response to Susan’s post as well. It’s the least he could do. After all, his testimony put an innocent 17 year old kid away for life and then some – the least he could do is to respond saying that his evidence was misused by the prosecution team. I can appreciate Waranowitz not wanting to publicly speak out about this — this is not the sort of attention or scrutiny anyone would want to subject themselves to, especially not 15 years down the line. But I feel confident that he knows his work was misused by the prosecution. I am a field biologist with about 20 years of experience working, often at night, in deciduous woodlands similar to those around Leakin Park. 1. The type of soil (compacted, stony, full of roots) that would be found in that location would be extremely difficult to dig in, especially at that time of year. In the 2 weeks before Jan 13th, minimum temperatures were regularly below 0 degrees C, which means the ground would have been partially frozen. The volume of soil that would need to be removed even for a shallow grave (one that in the podcast was described as a very well hidden crime scene based on the photos) is considerable. (Did anyone eve measure the size of the grave and estimate the volume?) I find it extremely unlikely that this could have been accomplished in the time allotted in any of Jay’s accounts. 2. All the accounts Jay gives of digging the grave have it happening after dark. In all his accounts, they leave the site and come back to it in the dark. If you haven’t actually tried to get around in the woods after dark, it is very hard to appreciate how extremely difficult it is to find even very familiar places, even with a flashlight. Anyone who does field work in the woods at night knows to map the area with flagging tape “coordinates” every few meters to help you orient yourself when you get hopelessly lost. Jay never even mentions a flashlight/headlamp. No moon, and no flashlights/headlamps — absolutely NO CHANCE they could see where they were or what they were doing. The idea that they could dig and conceal a shallow grave in partially- frozen wooded soil, in the night without flashlights, with an ice-storm coming in, using a couple of garden implements in less than an hour or so is completely incredible to me. I would love to see someone try to re-create this under conditions similar to those on Jan 13th 1999 — I bet the mortgage that they will see this is not possible as described. I’m not even convinced shovels were actually involved in the burial. For all the evidence shows, she could’ve been placed in a shallow natural depression (interestingly, Hae was found near the root-end of the fallen down tree — most likely place for a shallow hole? ), and then soil and rocks were thrown on top. What is most mystifying is that, like you said, it’d be nearly impossible to do in the dark — the problem is that if someone tried to do it in the day (or with flashlights) they’d be plainly visible from the road! Then again, this could also explain Mr. S’s involvement — he noticed the odd activity as he drove down N. Franklintown, and after learning of Hae’s disappearance through the media, he got curious and went to check. Susan – I am unclear about where and how you are suggesting Hae was buried. A depression near the end of the tree or the actual hollow created by the root ball, without tools? I don’t think the evidence supports either theory. Dr Rodriguez, the anthropologist, in trial 2, agreed with Guitierrez that Hae’s body “while not quite in the middle was more in the middle than at either end” of a large fallen tree (possibly 50 foot) (p181, line 4). Hae’s body was parrallel to the log. Guitierrez describes it as “nestled against the log” (p180, line 18). Also, the note sent by Kathleen Murphy on 31 July 1999 entitled Summary of quotes – interview of Dr Rodriguez by ASA Wash on 11 February 1999 states that the grave ‘Area had been dug out’ so a grave HAD been dug out. The body was on its right side in the ground. Rocks were on top of it and yet nobody describes a mound. Dr Rodrigues in his testimony says that the grave was “very well camouflaged” (trial 2, p182, line 5). It completely blended in with the surroundings to the extent that the state’s surveyor missed the body when he arrived to take measurements. He nearly walked right on to it. So someone went to a lot of trouble and probably time to hide Hae in a pretty professional way. However, the summary note prepared by Ms Murphy also states that ‘Couldn’t tell if tool used’. I, too, find this second statement strange. Perhaps it’s more directly relating to the plant material she also refers to in the same paragraph. I wish we had the actual interview. Again, Dr Rodriguez was never questioned about this at trial so we’re left with speculation. I’ve never been convinced by the 6″ shallow grave version from Jay and no one else seems to have taken measurements of the grave, but it just seems too shallow to contain a well developed young woman with rocks and soil on top of her without a noticeable mound. Jay says he dug the grave ‘shin deep’ and ‘a foot’ deep in his first interview and I find that much more likely. The phrase ‘shin deep’ is so descriptive of someone standing digging in a grave and its depth so clearly identified that it makes me think that it is true. If it was that deep and Hae’s body, lying on its side, was well covered with soil and rocks (her body only having become exposed by the actions of animals) then he/they must have used tools of some description. I’d be surprised if a pick axe didn’t leave clear slicing marks in the ground but that is one of the tools Jay describes using in his first interview. Obviously a more thorough burial would have taken a great deal more time than is allowed by the 7-8pm time line and it would have been a dirty messy job too but I do think it is supported by the evidence.
. Dr Rodriguez, the anthropologist, in trial 2, agreed with Guitierrez that Hae’s body “while not quite in the middle was more in the middle than at either end” of a large fallen tree (possibly 50 foot) (p181, line 4). Hmm. That’s very interesting — I’d overlooked that he had testified to that, and it conflicts with the crime scene diagrams and documentation. Not sure which is the more reliable, but I have a hard time disregarding Buddemeyer’s diagrams. There was a mound of dirt over her, and from what I’ve seen, the 6″ grave seems to be accurate. Obviously a more thorough burial would have taken a great deal more time than is allowed by the 7-8pm time line and it would have been a dirty messy job too but I do think it is supported by the evidence. It’s only supported by Jay’s testimony. So, not supported. Thanks Susan, I haven’t seen the Buddemeyer diagram, he’s the county surveyor who was in the podcast right? Is the diagram and documentation available? I would expect him to get his measurements and drawings right, that his job, but perhaps he wasn’t drawing the 40-50′ log to scale. The Rodriguez point from the trial transcript was actually clarifying Guiterrez’s assertion that the gravesite was in the middle of the tree/log, so both of them are roughly agreed, which is why I found it persuasive. I’ve never seen mention of there being a mound over the grave, not from police, Rodriguez or Budemeyer. That’s why I thought a 6 inch grave with a body on its side and with rocks and dirt over it was pretty much impossible. I’m roughly Haes size and weight and I measure a good 15 inches at shoulder and hip, there’s no way I’d fit in a 6 inch grave. Buddemeyer says in the podcast that he was a step away from the grave and he still couldn’t see it which is odd if it was covered in a mound, and Rodriguez as noted above says in his testimony that it was ‘very well camouflaged’. Where have you got the description of there being a mound? Finally from what I’ve seen the 6 inch grave is only supported by Jay’s testimony too, so touche Ms Simpson! Buddemeyer was the surveyor — his diagram has the distances in feet alongside his sketched out diagram, and according to him, she was very much at the northwest end of the log. Well, after the officer pointed it out, the location of it, it just appeared to be a mound of dirt that had been undisturbed for a period of time. It wasn’t freshly disturbed. I’m not sure what to make of the Buddemeyer/Rodriguez discrepancy. The investigators had Rodriguez refrain from writing anything down, so they wouldn’t have to hand it over to the defense — maybe the lack of writing affected his memory? Or maybe Buddemeyer was incompetent. It’s odd. “Here’s Buddemayer testifying at trial. When I arrived at the site where the body was, there was a log on the ground approximately forty feet long. I stepped over the log, I walked along the edge of the log expecting to find the body real soon. I never saw one, at which time had I taken one more step I would have walked on the gravesite where the body was. And at that point there were others on the scene? Yes ma’am. There was a lot of people there. Yes ma’am. The detective pointed out the site. I looked down at the ground, and I said “I don’t see any body.” It wasn’t freshly disturbed. It was not freshly disturbed. It sounds like this conversation should be in the court documents but I can’t find it, unless its in the grand jury testimony? It’s so frustrating that such a basic fact as a 6″ grave with a body on its side, covered in dirt and rocks is not meticulously recorded! I am still amazed that there was not a noticeable mound. If I was buried on my side and had ‘dirt’ covering me even by 2 inches, my body and the soil would be almost 1ft above the surrounding ground and then there would be large rocks on top of the body. To my mind, that would definitely present a grave style mound that would be obvious to anyone. Please can you provide links to the diagram and your quote. Thanks! The reason I’m so obsessed about the burial site is that it seems to me that this is the first actual piece of evidence in the case. Yet even this is poorly documented. There’s no actual contemporaneous report from Rodriguez and what we do have seems inconsistent eg ‘Area dug out’ but can’t tell if tools used. There’s no description of the depth of the grave by the expert who carefully, centimeter by centimeter exposed the body using a trowel and brushes! Another thing that hardly seems mentioned are the blue and orange fibers found on top of and below Hae’s body in the grave. Could these indicate something Hae had been lying on or was wrapped up in etc or could they be from Hae’s jacket that Jay describes Adnan throwing away as he walked back through the woods to the road that Jay describes (in the moonlight) as being blue and red. We don’t even know what Hae was wearing when she disappeared! If she wasn’t wearing her blue and orange jacket that day, then the fibres take on a greater significance. This is the first verifiable lie/truth spoken by Jay yet we can’t even confirm this! I’m really enjoying your blog. Keep up the amazing work! Maybe Jay came back later to complete the burial? He says the burial happened around midnight in the interview he gave last month. Maybe that was his second trip? But it would have to be a completely different night to have moonlight and he would have needed a ride to do it. Multiple trips plus a need for assistance allow more opportunities for S to find out about it. The idea that she wasn’t really “buried” at all — that she was placed in a natural depression (such as a tree well) and that rocks and debris were piled on her (like a rough cairn) makes MUCH more sense than the idea that a “grave” was dug and filled in. It still would have been very difficult to do in the amount of time, at the stated time of day, and under the weather conditions of that day (e.g., not easy to find enough loose rock and debris to in the dark to effective cover a body; there simply isn’t “loose soil” lying around in that type of forest, especially in mid-January, etc.). The problem with an incomplete burial (i.e., a job that is started and finished later) is the chance of disturbance by animals. I am guessing that there are coyotes in that park; at that time of year when food is scarce, I would predict that partially-covered human remains would be quickly found and disturbed. So is it possible that the the location was scouted in daylight, the depression and tree log noted, and then the perpetrator returns with the body at dark, maybe even with stones to cover. Or he leaves the body just before dawn the following day. Jay’s mention of the “moon” may relate, in truth, to light. As for the body in the trunk of Hae’s car, is there evidence that proves she was ever in there? Or might she have been transported in another vehicle? With the number of bodies left in Leakin Park, it would seem that among a certain set of people, Leakin was known as the place to get rid of a body. I want to like this comment a thousand times because this is exactly what I’ve been thinking since I heard the first episode of serial. I’ve done a little bit of camping and watching badgers and deer after nightfall in and on the edge of woods and was also struck how hard and dangerous it would be wandering around woodland at night without a torch whilst carrying a body, digging out a grave and bury a body, finding rocks etc etc but Jay does state they had no torch. The only thing that I think makes is possible is the layer of snow/patchy snow that Jay variously describes as being present. Jay says he could count change but not read a book in the light available. I have been out at night when snow (with the moon obscured by cloud) has been present and in those types of conditions it is possible to see to that level. Of course the freezing rain and snow like conditions lasted days and I’m not sure how long snow would remain in the woods so the fact Jay says there was snow/patchy snow on the ground does not definitively support tge view that Jay was in the woods on the 13th. With a fuller moon then lighting would have been even better and the light better still so another night might have been better to carry out this dreadful crime. Also, I’m not sure that the soil would have been frozen. In my experience the canopy of woods protects the ground from the worst of snow etc. It provides protection and limited cover – even in the winter and snow is a good insulator. I’m pretty certain the soil wasn’t frozen. It never got far below freezing around then, and the high on Jan. 13 was about 58 degrees. I think it was almost that warm the day before. Can’t say all the snow and ice under the trees in the park would have melted, but I can’t imagine there was much of it. I think Jay overstates how bright it might have been, either at 7 pm or near midnight that day. I agree; not “hard” frozen or frozen all the way through the top horizon. But even partially frozen soil is very tough to dig. I think the lows were below freezing for most of the preceding days, and unless you get direct sun soil thaws slowly. Honestly, it’s more the composition and the root content from the understory that would really make it challenging. Lizzy, you are correct that snow is a great insulator and that the canopy would protect the ground from freezing. However, the map I saw suggests there wasn’t a closed canopy and I’m guessing that any snow cover was patchy at best (which also doesn’t argue for visibility). I agree with you and Kevin though I think an open canopy would allow more snow/frost in so greater visibility but I’ve recently had a thought that makes me wonder if two visits were made to the site. How do you (in the dark, with little moon and no torch) find rocks and feathers and green vegetation to put in, on top of and around the grave when the rocks, vegetation and feathers are covered in snow or patchy snow or frost? We’ve just had 10-15cm or so of snow and even at that depth you can’t tell the difference between tufts of grass or rocks when they’re covered with snow and you most definitely wouldn’t be able to find green vegetation or feathers. In your previous post, you mention the fax cover page from AT&T Wireless responding to the Baltimore P.D. subpoena contains two critically important pieces of exculpatory evidence: (1) incoming calls are not reliable for determining location, and (2) an explanation of the billing format for incoming calls that are unanswered and forwarded to voicemail. The first casts doubt on any inferences that can be drawn from the 7:09 and 7:16 calls (on which the prosecution hangs its entire case), and the second destroys the prosecution’s use of the 5:14 call to impugn Adnan’s alibi. Yet when defense counsel cross-examines the AT&T engineer, she never mentions either point. You said you had obtained the cover page from the police file, NOT from the defense attorney’s files. If that document was not provided to the defense, isn’t that a clear Brady violation? The transcripts also provide further evidence for the ineffective assistance claim, demonstrating how Cristina Gutierrez was clearly impaired in her ability to mount an effective defense by her declining health. See discussion of diabetes, blood sugar, vomiting, etc. pp. 164-165 — a discussion that occurs when Adnan himself is not present, so he may have had no idea that his attorney was in such poor health. Fine work again, Susan. Sure wish we had known about you right around the time they told us about the WMD and that the war in Iraq was totally legal. I know this is probably too much to ask but is there any chance you might do a post outlining what your best-fit narrative is now – based on the evidence and the amazing detail of your work here and on the ground? Or failing that a list of questions you have outstanding? yes yes! Do this, please! Thanks for all the great work, Susan. Looking at the phone log and knowing that incoming calls cannot be used to determine the location of the phone, it is easy to see Adnan’s version of events as most likely. After the 10:45 call to Jay-all the calls that day, until 5:38, excluding one were to Jays’ friends. That one call, to Nisha at 3:32, was when Jay’s had the phone, according to Jay, and Adnan said he was at track, and Nisha said the call with Jay was on a later date. Calls to Adnan’s friends start at 5:38, after track, and continue until there is a break in the calls, roughly 8-9, when Adnan is in the mosque. After 9ish all the calls are to Adnan’s friends. How does Patapsco fit with the cell phone evidence? I found this reddit theory interesting. Just wanted to say thank you to Susan for your incredible research and insight on this case – I think Adnan lawyers should have you join them in his defence. In my opinion, if we could combine Colombo, Sherlock Holmes and all the others into one and set them out on this case, they would finish a distant second to you. Yes, your work is that that good. After all this, I am tempted to build a profile of Jay, according to Jay’s own testimony. Believe me, it is not very impressive. Starting with his interview with the Intercept where he speaks unkindly of not only Adnan, but his own former girlfriend. Is anyone up to this? You are WRONG about Gilston Park. I don’t know if this changes anything in the analysis, but the park at Chesworth and Gilston used to be the “north Catonsville Community…” park and Gilston park was indeed west of rolling (not Rolling Rock, just “Rolling” Road) off of “GILSTON PARK ROAD” which is where you indicated “just a field was”. It is a field now, with utility towers on it, but this was not always the case. When the towers went up (sometime between 2000 and today – in fact probably at least 5 years ago) the signs came down on the “field” which is actually Gilston park. This link has a dated map, as well as a PICTURE OF GILSTON PARK WEST OF ROLLING Road. In the picture linked below, on the west side of rolling, in what looks like a field, just above and to the right of the no parking sign you can see an upside down U shaped set of timbers very faintly. This is where the park sign used to hang. This picture was likely taken at some point when the sign was down but before the utility towers went up (and even the timbers holding the sign were taken down). The link also shows both your “false” Gilston Park (which used to actually be GIlston) and the Westview Park location which was not Gilston. Ever. I live in the area so when I read this I was skeptical … I remember the greenspace west of rolling road. Don’t assume what you discover now is how things always were back in 1999.
and Deeply Flawed | The View From LL2 <Liked it!